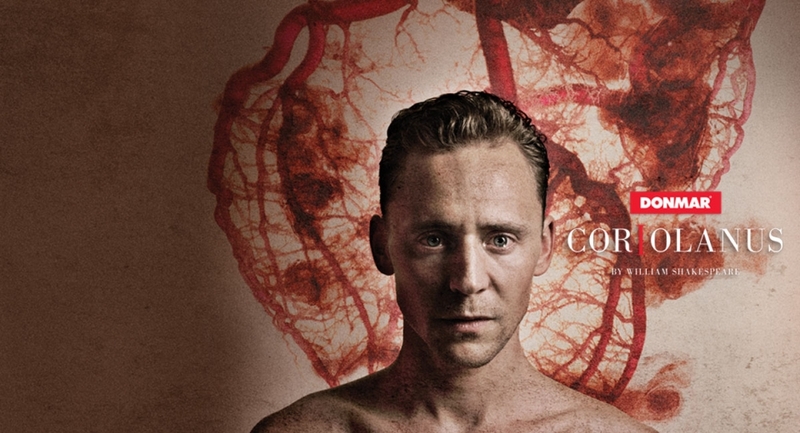 A couple of weeks ago I managed to secure myself and a friend ‘Barclays Front Row’ tickets to see Shakespeare’s Coriolanus at the Donmar Warehouse, starring the achingly talented Brit actor Tom Hiddleston (Thor, The Avengers) as the commanding figure Caius Martius; later nicknamed Coriolanus after his courageous siege of Corioles. I couldn’t believe my luck as the original tickets flew out within a matter of minutes, and the elusive front row tickets were selling out in a similar fashion. On Monday night we attended the theatre, shuffled ourselves into our seats and anxiously awaited the moment the lights would dim and the play would commence. Josie Rourke’s production runs for two and a half hours which seems to fly by once you are engulfed in the action. If you’ve ever been to the Donmar then you’ll know that the stage is tiny. The audience are situated not too far away, adding to the all encompassing feel of the production. Set against a modern backdrop of chaotically strewn graffiti, with a lone ladder centred towards the back of the stage, the play kicks off with a young blonde boy darting about the floor wielding a sword. We later learn that he is Coriolanus’ son, a figure of innocence caught up in the political turmoil of his father’s brutal and bloody world. The actors stay within view of the audience when not in scene, seated along the back wall. The play is packed with plenty of physicality throughout, with bloody exchanges between Coriolanus and his enemy Aufidius (played by Hadley Fraser) and a scintillating moment of solitude when Coriolanus must wash the blood from his wounds, standing shirtless beneath a singular stream of water tumbling down from above the stage. At this moment we get a glimpse of the heavy burden Coriolanus carries around with him like an unwanted trophy, the unrelenting pressure of the soldier. The battle wounds etched across his body are testament to this fact. The cast is extremely diverse, with a few rough Yorkshire accents thrown in which contrast starkly next to Tom Hiddleston’s eloquent rhetoric. Each actor brings a dazzling vigour to the play, bounding onto the stage at the beginning of each scene with ferocity and determination. The dialogue is delivered with such charisma and conviction that it’s hard not to fall for Tom Hiddleston’s Coriolanus, despite his many faults. He exudes a sort of cunning charm that makes you sympathise with his frustrations regarding the state of the people and the rabble who seek his downfall. You end up rooting for him, even when his actions become infuriating. Deborah Findlay delivers as his militant mother, who delights in the gruesome exploits of her warrior son, until she passionately begs him to re-consider the violent impulses she has instilled in him when he plans to destroy Rome. The scene in which Coriolanus considers his wife (played by Birgitte Hjort Sorensen), child and mother’s pleas to spare the city is agonisingly tense and we see just how skilled Tom Hiddleston is at his art. Tears roll tenderly down his face as he acknowledges the heartache of his family and the bleak reality of his own fate. Coriolanus is a product of his upbringing and it can be argued that every move he makes is a result of his mother’s staunch indoctrination. The cry that escapes from him during the harrowing scene: “Oh Mother, Mother! What have you done?” encapsulates the calamitous nature of his predicament. His wife’s delicate and overtly affectionate display also brings tenderness to the whole performance. Alongside the immensely sorrowful circumstances, there are elements of comedy in the production. The witty quips and remarks spoken by Coriolanus and his comrades brought humour to the narrative and evoked roars of laughter from the audience on numerous occasions. The rise and fall of the treacherous Roman rogue is thrilling and compelling to watch. We see a man caught up in his own vices, who is ultimately a victim of his own fatal flaws. Tom Hiddleston brings contrasting strength and vulnerability to the character in abundance and is outstanding as the tragic protagonist. Coriolanus is packed with energy and raw emotion, and offers a fresh portrayal of Shakespeare’s work. I suggest you go and see it immediately if not sooner. The production will also be broadcast at cinemas across the UK on January 30th 2014.